In this this post, I’ll explain how to figure out your daily calorie/container intake for the 21 Day Fix portion control diet. Don’t worry you’re not going to starve on this innovative color coded container based diet. Actually, you are probably not going to be very hungry on the plan at all. I hear more often that eating all of the food that the 21 Day Fix diet allows each day is difficult for lots of folks. But we will cover that area towards the bottom of this post. What a lot of people don’t know about the portion control diet is that it is also macro-nutrient portioned, meaning you get the right percentage of proteins, carbs, and fats to keep you body running optimally to fuel your body for your workouts and overall health. The above is covered in greater detail in the 21 Day Fix eating plan, I have created a 21 Day Fix food list and sample diet here for people also. To match your calorie level to the amount of containers you should be consuming on a daily basis ,you first need to do a little math. But don’t worry – it’s super easy! A. Take your current body weight in pounds and multiply that number by 11 to calculate your baseline calories. B. Then, add 400 to your baseline calories to equal your daily caloric needs. C. And then, subtract 750 from your caloric needs – this equals your calorie target. Multiply your body weight by 11 and add 400 calories. Multiply your body weight by 11 and add 900 calories. Very important! If your calorie target calculates below 1200, roundup to the 1200 level. You should NEVER go below 1200 calories in a day – it is not healthy over an extended period of time. Somewhere along the way I saw a very cool chart that showed body weight above each calorie target level and then the corresponding containers below them. Since I can’t find it, I decided to reproduce something similar below. Match your body weight to the corresponding column in the top row and you have your calorie level and container amounts listed below. Q. As I lose weight, do I need to recalculate my calories? A. Yes, I would recommend recalculating after every round of the exercise program if you have more than 10 lbs to lose or after each week if you have less than 10 lbs to lose. Q. There is more food than I can possibly eat, what do I do? A. You could try eating partial containers, or you could rotate the containers you can’t fit in. Try not to skip any containers you only get a single serving of each day or your teaspoons. I know people’s first tendency is to skip their one orange container or their teaspoons, but both are necessary for a healthy functioning body. A. It is entirely up to you. Three main meals and two snacks is customary, although three larger meals or five smaller meals are fine too. It’s whatever works best for you. Q. Do I eat the total amount of containers per day or per meal? A. The total amount of containers is meant to be distributed throughout your day. Did I miss something, need some help, or have a tip? Please leave a comment below. If I am starting the 21 Day Fix and cannot do the exercises right now due to my heel and wearing a brace, do I subtract anything from the calories that I would consume? I’m assuming the portions are also based upon the workouts of the program? Thanks!!! Hi I am trying to lose weight and when I calculate my numbers it says 1828. I think that’s a lot to lose weight. I work out 5 days a week but not doing the 21 day fix work outs so what calories should I be eating. Thanks. Hi Nicole, You lose weight as long as your body is in a calorie deficit. So if you ate the 1828 and your body used 2328 through exercise and other bodily functions your calorie deficit is 500 calories a day. That would be a calorie deficit of 3500 calories over the week which would result in weight loss. I would at least try for a couple week what is recommend before adjusting your calories. I am just starting the full 21 day fix program (I did the workouts once before but did not follow the portion control). I am following the 1200-1500 level, but am STARVING throughout portions of the day. I am only on day three. I started counting the calories, in addition to measuring with the containers, to try and determine why I am so hungry. When I calculated calories for my food, it only came out to just barely over 1,000 calories. This is with eating every single container (and some of them perhaps filled a bit more than they ought to be). Should I add more containers in? I am following the list of allowed foods and amount of containers to the “T,” however the calorie count is nowhere near where the tier says it ought to be for that many containers. Thanks! I’m currently 155lbs, and I noticed that once I drop down to 140lbs, using the calculations for the container plan, I would end up consuming less than 1,200 per day (140 x 11 = 1,540 + 400 = 1,940 – 750 = 1,190 kcal). Would this mean then that I would need to try some different calculations once I drop down to 140lbs? I’d still have another 20lbs to go after that, so I’m a bit confused as to how to go about things. Hello! I am wondering about finding how many containers I need during pregnancy. Do I use the weight I am now or do I use the weight that would put me at my total gain goal? I am 27 weeks and have just barely gained 16 pound but I started over weight (by the weight gain charts…). I just want to develop good habits now before the birth and to keep my weight gain in check. Thank you. Hello, this is a question I would suggest talking to your obstetrician about. I’m at the 1800+ and I’m confused. It says 6 protein so would I need 6 red containers? The 1,800 to 2,099 calorie container level is 5 red protein containers. The 2,100 to 2,300 is 6 red containers. 6 Green, 4 Purple, 6 Red, 4 Yellow, 1 Blue and 1 orange? Yes according to the guide that is your level, and don’t forget the 6 tsps. I used this diet plan when I was in college and used various workout videos I found on youtube to assist in my weight loss. It worked wonders! However, senior year and the years since have been rough and, I have unfortunately gained about 35 pounds and would like to lose the weight (preferably within a year). My current calorie target is 1200 calories a day. I was just wondering if my height will change my target caloric intake? I am on the shorter side (about 5 foot 1 inch). Hi Melissa, Your height does not change your 21 Day Fix calorie target. when I calculate my caloric intake for the 21 day fix, it says I am at about 2079 calories for the day. I am also trying to lose. it seems like a high number for someone trying to lose, not maintain/gain. I have also used a macro calculator and based off my weight and exercise level, it says I actually should be consuming around 1600 calories a day. My fitness pal says the same. I am a little confused on what to believe. I do want to lose, but consuming more than 2,000 calories a day seems like I would actually be maintaining or gaining. I already walk 30 minutes a day on my lunch, I am not sure if this changes anything. Would the 21 day fix be more accurate than the macro calculator? thanks! Hi Bethany, I am confused with the grey spoons. I use some coconut or olive oil to coat the pan to cook meals. Do I have to use the gray spoons for that or am I supposed to just drizzle the oils on salad etc. Also if I did that and use a cooking spray to coat the pan, do you have an idea of how many sprays equal a teaspoon of oil? Thank You! my weight is 101 which makes, my calories somewhere around 761, so where do i fit in the container level chart? I weigh 167 and I calculate 1487 calories. Do I round up and go on plan B or round down and go to plan A? Hi Janet, If weight loss is your goal then you would want to follow 21 Day Fix Meal Plan A according to the book. Hope this helps. I am hoping you can help me out. I have been doing LIIFT4 for 4 weeks now along with the container system. I have lost 2″ but have not lost any weight. My beachbody coach recommended that i go up to plan B. I currently weigh 156. If i do the fixate calculation I should have 1,416 cals a day. To maintain weight I should have 1,700. My worry is that if I jump up to B, I will continue to maintain, or gain weight. What do you think? Hi Sarah, Losing 2″ is very good! According to the LIIFT4 nutrition plan you should be following Plan A for weight loss & toning or plan B for for muscle gain. Since your measurements went down but your weight remained the same you probably replaced some fat with muscle, which takes up less space than adipose tissue. I know it can be frustrating to not see the scale going down but it is not always the best indicator of progress. If you took before pictures I would suggest taking a couple photos and check out how you are progressing. Images, results you see in the mirror, and how you feel are often the best indicator of progress. Can you clarify, the gray “spoon” symbol…is each spoon ONE(1) tsp, or do you do two (2) tsp per each spoon symbol? Ex: 1 spoon symbol = #tsp?? Hi Bethany, I wonder if you could tell me how you’d divide a paleo smoothie that I make, into the containers? It has so many small amouts of ingredients that could fit into a number of categories (except for the obvious fruit serving). I’m petite, like 5’2 and generally fit but want to lose maybe 5 lbs for the summer. I am attracted to the simplicity of this system, but my problem is that because I am such a small person when I do the calories to lose weight calculation it’s like, 970 calories or something, so of course I round up to 1200 because thats the safe range. However, everything I look at for this system has the lowest calorie range you can do 1200-1475. Even at 1200, I lose weight SUPER slow, it’s annoying. At 1400 per day, I would literally lose like one pound per month, and that’s ridiculous. How do people like me make this system work for them? Hi Genie, I always tell people the last 10lbs are the hardest so when you are dealing with the last five you got to be really dialed in on nutrition and workouts. I would be happy to lose a pound a month when that and be able to keep it off. I have the same question! I am 5’0 and I calculated my calories and I am supposed to have 1,113 calories, but the lowest plan is 1,200-1,499 and I am worried that if I follow this plan I may actually gain weight (the opposite of what I am looking for)! Is there anyway to adjust the plans to work for this? Hope you are well. What I am having a challenge with is meal prepping/planning. For example, can I cook all my veggies (and fats, e.g EVOO) for the week using the allotted containers and then just breaking them up per day when prepping my containers? Are there any meal prep examples that you can share? Also, per the 21 day fix calculation I currently fall in the 1500 – 1799 calorie range. However, my fitness pal says different – gives me less calories, 1330. Which should I follow? I am in the 1200-1499 calorie bracket. I am vegan. Per the plan I should eat 5 green, 3 red, 3 yellow etc. if I have to add all calories per my fitness pal website, the total calories go way over 1499. It is 1850. Do I have to cut down and how much! i’m a 52 year old woman at 267 lbs. What are my color container numbers? I can’t find it them. According to the chart you would start in the last bracket. As you lose be sure to readjust the numbers as you go. 4 yellow, 1 blue, 1 orange and 6 teaspoons. I have PCOS which makes losing weight very difficult for me regardless of how healthy I eat. What can I do to help accelerate my already very slowed metabolism? I am 216#s, but a lot of it is muscle, so I’m more so about 185lbs. What foods should I avoid or eat more of? Would it be okay to juice all my vegetables and then drink them? Or do I need to eat them whole? Thanks! Fruit is not something that is easily found this time of year. Can I swap a green for a purple instead? how do you figure out a salad with veggies and protein that you get from a restaurant? or even a meal at a restaurant? I am going to be traveling on vacation and plan to eat out (healthy) in a week but want to make sure I stay on track. thank you so much. your site is so informative and all the questions people are asking. My calculations come to a cal count less than 1200. What do I do? Hi Nancy, You round up to the first calorie level. If my calorie level for losing weight was 815, wouldn’t I gain weight eating 1200 calories? No because your internal organs and other bodily functions need and burn calories too. Hi Bethany, for me I’m suppose to have 4 fruits a day. When I have a banana it seems like it’s about 1 1/2 bananas to fill 1 purple container . If the the banana is 9” long is this normal to have more then 1or should I go with just 1 banana to count as 1 fruit? Thank you so much for all of this helpful info! I am just getting ready to start with containers and I have a question! My calories come up to be 1259/day. If I follow the column for 1200-1499, won’t I be eating too many calories? What if I generally eat 1400 calories in that column? Won’t I end up gaining weight? Hi, I am currently 135 pounds, which will put me into the 1st category of 1200 calories. I am currently nursing an infant and always feel hungry as it is. I did the BOD workouts through my pregnancy but now I want to add in the nutrition to lose the rest of the baby weight. My question is what bracket should I be in to safely lose weight (10 more pounds) without affecting my milk supply? Thank you in advance!! Hi. I have a question. When it tell you to eat 1200 calories and use the containers I’m confused. Do you count calories or just use the containers in each color? You just count containers, this will put you in the calorie range depending upon your level. trying to calculate with weigh of 336 lbs but dont see it on the charts , looks like 3346 but how do I figure containers? So if I am 300# and I use the calculations it puts me at 2950 calories…. I do not see that on the chart what do I go by? I would probably go with 8 green, 5 purple, 7 red, 5 yellow, 1 blue, 1 orange, and 8 tsps. This is the range given at the extreme program for 2,500 to 2800 calories. Hi.. Can we follow the meal plan to lose weight without doing the workouts? I need to modify the diet because I am pre-diabetic. I need to know the number of calories for each food group for a 1200 calorie diet. For example, 1 serving of green/Veggies = 45 calories ???? If I’ve eaten all my green containers by mid day, is it ok to add one more green container? It would be 4 instead of 3. Thanks! Thank you for all the information. My question is,what happens after the 21 days? Wouldn’t you just gain all the weight back if you do not continue to eat these portions long term? Is there a way to alter this into a long term plan? Whats the difference for the portions for 21 day fix vs the extreme plan? If I weigh 109 (I’m 5’3 & 53 years ol) and want to lean out my muffin top, do I want to maintain my weight or do I want to lose it? I’ve been on the 21 day fix for 5 days (target is 1599 cals) & now I’m questioning if I’m in the right calorie intake category?? Should I drop it down to 1200 cals? Thanks for your help!! Hello. What about my own recipes? Say meat lasagna or chicken and rice where there are proteins carbs and veggies all in one? How do i convert those to containers? I would like to lose weight and it says that I should be consuming 2378 calories. I weigh 248 pounds. Will I be able to lose weight consuming 2378 calories? Hi. Can I walk instead of doing the workouts, and how long would be the equivalent? My fitness pal says 1200 calories a day but my calculations for this says 2000. That is a big difference! Does that sound correct for 220lbs? Hi KAren, You can do a walking routine with the container portion control system. I’m not sure the amount of calories each Fix workout burns or the equivalent of walking but you don’t need them to be the same anyways. Just make gradual improvements and you will see a difference. Myfitnesspal calculation seems to tell everyone that number, 2000 seems more accurate to me. Hello, could you please tell me what the estimated amount of calories is per container…. like for the carb container, should it be 80 – 100 cal per serving? I know the whole point of the program is to not have to count calories, but I am finding that many of my foods are not container friendly and it would be really helpful to know about how many calories there are per serving per container. For example, I like to eat a spinach wrap at lunch. They are pretty large and I know 1 tortilla counts as 1 carb container, but these wraps are bigger than a tortilla and I want to know if it should be counted as 2 or even 3 servings. I want to know if I eat a slice of cheese instead of shredded cheese do I need to only eat half or will one slice still count as one serving, etc. etc. ..
– Can I use chocolate almond milk for my smoothie and how do I count that? – I see a lot of healthy ” meals” on pinterest, but how do you count the containers once it is all mixed together? -I do a morning smoothie but I make my own. I do not use Shakeology. How do you count a scoop of protein powder? I am having a total knee replacement April 28th and need to get some weight off quickly. more sense re whole foods and exercise. However I have a lot of isagenix shakes left that I’d like to use as meal replacements. They have more protein, fat and carbs than shakology. How do I figure out what they are equal to? Also can I have a shakology plus an isagenix meal replacement in one day? Thanks! Red and a purple maybe or a yellow. As far as two shakes a day, there is no rule against it. I was doing the 21 day fix & 21 day fix extreme last year for 6 months. My husband and I bought a house and we had some major renovations going on so I stopped the workouts. Now, 5 months later I am still not doing the workouts but I am really motivated to begin the exercises. I’ve found out that I am 5 weeks pregnant and I was wondering if the workouts will hurt my baby. Also, how do I calculate the container amount now that I am expecting a baby and I surely don’t want to loose any weight. I am a long time insulin dependant diabetic and watch my carb totals. Is there anything that I should change or be aware of before starting? My doctor just said that I should know what I’m doing. My husband and I are just beginning the 21 day fix. According to the plan we fall in the D category, but that would have us eating a minimum of 2100 calories. We want to loose weight and planned on taking in 1200 calories. What am I doing wrong in my figuring? Hi Sharon, It depends ona few factors, what level are you at for instance? How do I determine what a serving is? For instance, chili, I understand it’s 1 red, 1 yellow, 1 green, but how much do I eat once it’s made? I have 21 day fix and meal prep for my husband as well. He weighs 280. So 280×11=3080+400=3480-750=2730. That’s way out of the 2100-2300 bracket. Is that the one I keep him in? Or is there one higher than that he should be following. He is looking to loose weight if that makes a difference. I am on the lowest calorie count and I can’t finish the food? Is it okay if I don’t finish all of the containers? I have never been a big eater. My weight is from birth control so I’m just doing my best to get off as much of it as I can. Hi Katie, You’ll want to do your best to try and get all of the containers in. Eating below 1200 calories daily for an extended period of time is not ideal for your weight or organs. I’m 140 lbs and my calorie count is 1190, which isn’t on the chart. Should I just follow the first column? I just ordered the containers and I am a lacto- ovo vegetarian. I was wondering if I can eat paneer? It’s kind of like a firmer version of ricotta cheese and fresh mozzarella cheese. Hi Zinal, I would count it as a blue container. I had never heard of it before, it does sound tasty. Does this calorie intake take into consideration exercise? Mine calculates to 1,960 calories, which seems like an awful lot to loose weight. Thanks! I am waiting on my package coming in. I have been watching what i eat and moving regularly. I am excited to start the workouts but i also love to walk and go frequently either outside or just on my treadmill. Will it be okay to continue this, or should i add in extra calories since i will be doing more activity? Hi Bethany, according to my weight (199lbs) when I started, I should be in the third column of the plan. I now weigh 195.4lbs on my third day of 21DF. Can I just move down to the column below it? 1500-1799? I should note that I had already started watching what I eat a week or two before I officially started the 21DF so that may have contributed to the difference in weight. Meaning I may have been less than 199lbs when I officially started the 21DF. I just started using myfitnesspal to track my containers and the food I put in them because I have not been losing any weight on the fix. I’m in my second round last week. I’m doing the exercises daily. The first round I lost 2 lbs and inches. This is my second start on the fix. Anyhow my question is related to the calorie deficit and total calories in that I should be seeing at the end of my day without the exercise. I am in the 2100 – 2300 bracket and after eating all my containers and teaspoons I’m seeing on average ~ 1800 calories in. So I would assume I’m not eating enough. Not sure where I go from here and what I need to do to make up this deficit. Any suggests? I appreciate your time and expertise! Hi Jen, I would stick the bracket the program says to use, it should still create a calorie deficit. A calorie deficit will cause weight loss adding exercise would create more of a deficit and help tone your muscles. Hi – I am wondering how this program works for men? I don’t see any comments or questions from men – but I am curious. I bought the containers and I am going to give it a try. Thanks! I fall in the highest bracket but feel it is too much food for me. Last time I did the fix I went down to the 2nd bracket and did loose weight. My question is, would I get better results if I stay in my intended bracket or is it okay to go to a lower one. I just started 21DAY FIX and Shakeology. I am in th 1800-2100 cal range. Shakeology is a meal replacement shake, but what is a meal? How many and what containers does a Shakeology shake count towards. 1.) If I have the shake plain? 2.) if I add things like coffee or yogurt or fruit do i measure them in containers first? 2.5) what color container is coffee or energy drinks I work two jobs and doubt I can diet and cut out caffeine at the same time. 3.) using the typical 3 meals and 2 snacks meal plan, what containers generally go into a meal or snack? Hi Angela, You can find the diet portion of the 21 Day Fix without the workouts here. Hi there. After calculation it says my calorie intake should be 1857. Can I go down to the 1799 column or should I go to the the 1800- one? Will 57 calories make a big deal? Can you eat more than 3 green containers if you are still hungry in a given day? Hi Janet, I believe the meal plan says you can add in containers if hungry/lack of energy starting with the green. 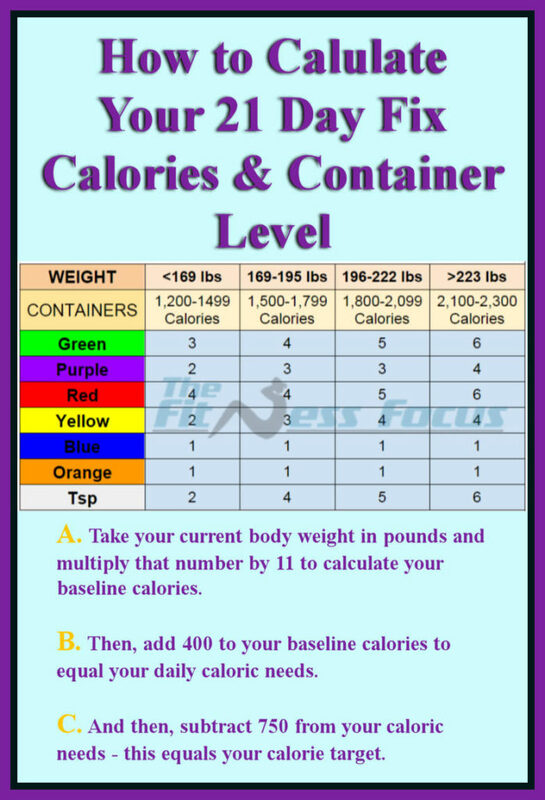 Hi Julie, According the 21 Day Fix nutrition guide when the calorie calculation falls below 1200 calories you should round up to the first level. Height should not play factor in the calculation. It is not recommended to eat below 1200 calories a day for an extended period of time for many reasons including your body trying to preserve fat. Hi Bethany! My current weight is 134, at 5’1″. So 134×11+400-750 = 1124 caloric target. Would I just fall into the first category? Is it ok that I’m below the recommended 1200 calories/day for my size? Thank you! Hi Marie, Yes, you go up to the first level. One of the reasons why we round up is that our internal organs require a certain amount of calories to function properly. I’m planning a whole new blog post to cover this topic as this is a frequently asked question. I calculate my calorie intake to be 1080. I don’t fall on the chart, how do I figure out my portions? Hi Jennifer, You round up to the first level. I’m just starting and this has been helpful. My whole package came in about a week later than the rest of the people in my challenge group so I have some catching up to do. Do the containers count my breakfast, lunch and dinner? Hi Christina, You decide which containers you are going to use for your meals throughout the day. I have a sample meal plan located under the 21 Day Fix category if you want to give it a look. I’ve had my metabolic rate medically tested and it was in the 1450 range, so if I add the 400 to my metabolic rate and subtract 750 I’ll be at 1100. does the 750 represent the exercise part of this plan? Hi Cindy, The 750 is the caloric deficit. The 400 is the Fix calorie burn. What happens if my calorie target is way less than on the chart. I weigh 103 pounds (I’m very petite only 4 ft 10inches). My calorie target came out to be 783. HI Monica, According to the guide people that fall below 1200 calories round up to the first level. I workout 4-5x a week and 2 are intense boxing. Should I add on those days? Hi Jem, Not if you are trying to lose weight. Remember the sweet spot for weight loss is 1-2 pounds a week(about a 500 calorie deficit a day), if you lose more than that then maybe you would want to increase your container level. What color containers would black beans and Greek yogurt be?? Hi Terry, Black beans are a yellow and Greek yogurt is a red container. I ordered both 21 Day Fix & 21 Day Fix Extreme, and while the workouts are planned out I’m having trouble figuring out the containers. I weigh more than 300 lbs. Here’s my Calculation. According to the 21 DAY FIX EXTREME Guidebook on pgs. 4 & 5. 370 x 11 + 450 – 750 = 3,770. Obviously, that Calorie Bracket isn’t in the Guide Book. So, how do I know how many containers to use if it’s more than 2,500-2,800 range? Hi Gary, I would use the 21 Day Fix EXTREME guidelines, they do say to drop down to the last level if your calories are above that. If you find yourself very hungry at that level, you could try and add in a container or two until you are satisfied, I would start by adding in a green then red if you need to. My shake is 240 Calories. Is that just 1 red container or should it be more? Hi Melanie, Is that a powdered protein or [re made shake? How many calories are in a pack of vanilla flavored Shakology with 10 ounces of 1percent milk and a cup of arras berries. Hi Mary Lynn, the shake contains 130 calories, I’m not sure about the other two. I know in the book it shows how to calculate your caloric intake if you plan to do Insanity and maintain weight after completing the program, but how should I calculate it if I plan to do Insanity and lose weight? Hi Emily, You would just recalculate with the prior calculation, but using your new body weight. 1) Can I drink 2 shakeology’s a day? 2) Also do i have to drink it after a workout, if i can only drink one? 3) How do I incorporate the blue and orange containers if i already don’t eat the type of foods that go in there? 3) What container would you consider to be good for a snack, i fall under the 1800-2099 column. 5) Do I get a day off with the workout per week or is it a full 21 days everyday you are working out. Ahmari, 1. You could be it is not necessary. 2. No, you do not have to drink it after workout. 3. Those two color containers are very important, lots of healthy fats in those foods, I would try your best to get them in. 3. The purple fruit container makes for a quick snack or even Greek yogurt for a red container, there is a 21 Day Fix snack ideas post you can find in the 21 Day Fix category drop down. 5. The workout program is 7 days a week, but 2-3 of the days are active recovery recovery days. I got there are different from the chart that it right below it. For example, to maintain my weight using the formula was 1,720 calories. Based on the chart below that I would be in the second column. But based on my weight I would be in the first column. Which one do I follow? Hi Kristina, The chart is to be used if your goal is weight loss. hi Bethany, can you explain why +400 then subtract 750?? why not just subtract 350? Hi Patricia, Adding the 400 determines your basal metabolism. An estimate of the number of calories you would burn if you stayed in bed all day. Hi Leanna, I would suggest talking to your doctor about your concerns. I know it might be frustrating, but your baby’s health is the most important and congratulations! if you know that you that you will not be exercising on a particular day, do you still eat the same amount of food? Yes, you still eat the same amount. Your body is recovering on your off days and it is using the food you eat to help help repair your muscles. I currently weigh 120 at 5’7″. I have been very slim most of my life, and I am looking to find a program that incorporates healthy eating with a good workout program, that would allow me to gain a little weight and get more toned. Can I modify the 21 day fix for this goal? Hi Lauren, Yes, you can modify the 21 Day Fix to gain weight. Depending upon age and activity level bumping up 1 to 2 levels should suffice. It depends upon the food. The diet plan lists which way, foods that change shape are normally measured before hand. I did the calculation and it came out to 3500 calories a day. I must be doing it wrong? Hi Emily, Maybe, if you want to tell me your weight, I can double check. Hi, I am a vegetarian (No eggs, no meat, no fish). I do consume dairy (milk, yogurt, cheese). I fall under lowest category of containers where I have to consume 4 red containers/day. Can you please let me know what else I can substitute in red containers other than meat? Hi Avi, I just posted a new blog post about this topic. It should appear in the 21 Day Fix archive category. I have just purchased the 21 day fix and noticed some of the foods I haven’t heard of, is this because they are only available in the US, I am in the UK. I am also a very bland and plain eater so a lot of these I wouldn’t eat so I just wanted to check that what is in the book under each colour is the only foods you can choose from. For example all the foods under the blue container I don’t eat apart from normal cheddar cheese, are there any other foods for that food colour that you can have that are not in the book. Hi Danielle, If you have access to Beachbody On Demand I would check the updated food list that is under the documents section. I have the same question/concerns that Bobbie asked on 2/17/16 and your reply does not exactly answer the ? 300 calories makes a big difference with a variable range as to how one can determine if they are/aren’t consuming the proper calories. Hi Joanne, At that range you are consuming the proper amount of calories to produce a sustainable weight loss. I just received the 21 day fix program. I should eat no more than 1200 calories per day. I fall into the 1200 -1499 calorie category . Since I am concerned about overeating, if I eat the recommended food allotment for my category , wouldn’t I be consuming 1499 calories? For example, for my category, I get 3 greens per day, should I cut that recommended amount to 1.5 to insure I only get 1200 calories per day? I’m just a bit confused. Hi Bobbie, No one should eat less than 1200 calories per day for an extended period of time. The Fix is meant to teach you correct portions and eating habits. It is not really meant to be a strict calorie counting program. And, no you would not necessarily be eating 1499 calories at that level, you would be consuming between 1200 and 1499 on average. I’ve been doing the 21 Day Fix and 21 Day Fix Extreme since May and have lost quite a bit of weight with this program. Lately I have been more or less maintaining but I have gotten back into the swing of things and would like to see 5 more lbs go. Last week I was 140 so I’m at the lowest amount of containers and when I fill out what I have eaten for the day on My Fitness Pal I was noticing I was quite low calorie wise. Since increasing my food I noticed I’ve already dropped 2-3lbs. In addition to 21 Day Fix Extreme I run 6 miles a day (4 in the morning and 2 before or after my workout video in the afternoon). I was wondering what containers and how many I should add to what the program has me doing now. Also, I just started eating cottage cheese 2% (one red) for an evening snack before bed, I’ve read a lot about the health benefits with this, is it ok to eat this an hour before bed on the program? Hi Minday, Yes, cottage cheese before bed is a great option. I believe the program recommends to increase the green and red containers first then yellow. This is something you can play with to find what works best for you. What time of day would I do the workout. Hi Maxine, You should do the workout when you can give it your best effort and the time works best for you. Just not to close to bedtime as to not disturb your sleep. I actually have a question. Where would a protein shake fall on this diet? Or does it not? I have NAR LABS Whey protein. I usually drink one a day. Are things like rice and pasta measured before or after cooking? Hi Paula, It depends, the book should tell you for foods that change shapes. Do i have to workout? can i use splenda, on my te or lemonada? Hi Maria, You can use Stevia which is a natural sweetener. Hi Jessica, You are in the third column. once iam done the program, how many calories do i eat normally again? I just ordered the 21 day fix for my wife and myself. We have 4 boys and rather than making two meals one for us and one for the kids, we would like to make one meal. How would we go about measuring our containers if we’ve combined food together? For example, a casserole dish? Or my wife likes to make saute veggies and mix them with noodles. So how would we measure a full green container of veggies if it was mixed with the noodles? Do we measure the veggies prior to mixing the noodles? I’m confused on how to use the containers far as throughout the day. I fall in the 15-17 calorie category, do I use the same amount containers for lunch and dinner or do I spread them out? For example it say I can eat 4 green containers does that mean 4 for lunch and 4 for diner? Or is it for for the entires day? I want to make sure I’m doing this right. And is it the same for the rest of the containers? I just have a few nagging questions I would love to have answered. 2- how do I measure things like fizzy drinks and tea? And how much sugar and salt should I take? 3- how do I measure things which are difficult to put into containers, like eggs? Hi, I know this isn’t the right page for this question but I need to know. I just bought the containers a few days ago but haven’t started using them since I still need to figure out my meal plan. This is difficult for me as I am Asian and most of the food I typically eat is not on the recommended food list. Things like Roti ( Pakistani version of a chapatti), I don’t know how to measure that and the Pakistani curries that I eat S well. Oh, one more thing, how are we to measure foods that are difficult to put into the containers? And so e foods which I am not sure what container they should go in. Such as fizzy drinks, amount of sugar to have and tea. Sry for the long post but these are so e of the things I could not find out I my research of this program so I will be very grateful if you would answer them for me. I have hit my goal using 21 day fix meal planning (yeah!!!) but could you explain how you calculate what containers I need to maintain my weight? I ‘m in the 2100-2300 range .. I weight 245 but I’m unable to eat all the containers . Can I go down to the next range and still lose weight ? I’m going to start trying to walk at least 15 min a day , have issue with my knees and need to easy into exercise. HI Tammy, You should try to eat all of your containers. But, you don’t want to be stuffing yourself either. You can do partial containers if you need to too. Is there a calculation that takes menopause in to account? Hi Alli, You may need to drop down a calorie range, but never below the lowest level. Consulting with a doctor would probably be best. Hi. I lost 25 lbs. Post menopause in 2015 on the 21 day fix. I was in the lowest calorie bracket as I was 173 lbs. & went down to 148 lbs. It took about 5 months to lose it, which was slower than the younger women in the group from our gym doing it, but it does work if you stick with it. I was doing maintenance for a year & didn’t gain any weight back, however, I gained about 4 lbs. Back over past couple of months. How do I lose it? Haven’t worked out much since gym closed 8 months ago. Also eating more junk I guess lately. Help!! Hi Karen, Sounds like you answered your own question near the end of the comment. Have you thought of doing a round of the 21 Day Fix again to back on track? For each of the container colors is there s designated amount (one ounce, 1/4 cup) and if so, how do I find this information? Hi Debra, The containers measure volume of food. A few foods that are odd shaped or nutritionally dense are measured different. For instance 12 almonds counts as blue container. All of this information is covered in detail in the 21 Day Fix Eating Plan that comes with the program. I work horrible hours in food retail. I am lucky if I take time for a lunch at all. I do however make poor choices when I try to down something. We have an amazing produce department and unfortunately an awesome bakery too. I really want to do well with this. Trying to be disciplined to take my meals to work is hard when my schedule is not normal. Exercise is very hard to fit is with 12-17 hour days and living an hour from work and being so tired. Which is also because of my excess weight. My question is can I do two shakeology shakes in the same day? Hi Cerra, You could do the two shakes a day. You could also do one as a meal replacement and then a whey protein shake immediately following your workout. For the blue container, it says Whole Almonds, 12 pcs and lists other nuts. Do I fill the blue container with the mixed nuts or is it where I’m only allowed 12pcs of Whole Almonds? Hi Jovina, 12 whole almonds is a blue container. A blue container also can be filled with mixed nuts as a serving. Hi Pamela, Could you please tell me where you received the error. The containers are not based on weight, but rather volume. How do you know how much food to put in each container. Do you have that on your website? Cups or ounces and etc? Hi Kristy, I don’t have the exact amount listed anywhere, that kind of defeats the purpose I guess. But, yes the food is measured by volume. I’m curious about white and red wine. I read somewhere it’s allowed but never have been able to find. It may have been mentioned on the info commercial. Giving wine up at dinner may be hard for my husband. Hi Carrie, It is on page 38 of the meal plan. 4 ounces of red wine can be used as a yellow container up to 3 times a week. Is the green vegetable container used as a measure of both fresh and cooked veggies? Should I be adjusting my veggie amounts on how they’re cooked?? I can no longer find my book…..
Hi Lori, If you access to Beachbody On Demand you can see which vegetables should be measured cooked vs uncooked. For the most part, the vegetables that lose there shape when cooked should be measured raw. I looked over the shopping list. Where do I add meats into the meals? Hi Regina, Proteins are red containers, I would recommend spreading through the day for breakfast, lunch and dinner. HI Taleen, Here is the link to the super sampler that contains all of the flavors. I am just starting this program and wanted to make sure that I understood the quantity of containers that I am supposed to eat. I currently weigh 310 lbs. So it is 310X11+400-750= 3060 calories per day? That seems like a lot of calories and I would never lose any weight. If it is correct can you tell me the number of containers that would amount to? what if i don’t have the colored food containers? I was looking over the meal plan for eating daily, I workout and after I drink a protein shake, where do I add that in? Do I put it in place of a red container? My calorie target is 2150 and that puts me into plan D. This is my second round of the Fix and I struggled to eat that much the first time. Since I’m so close to plan C anyway would it be okay for me to use that target instead? Can this work without the workout program? According to my fitness pal I should be consuming 1480 calories to lose 2 lbs per week( I add 500 to this because I am nursing), I weight 256.6 lbs, so this plan tells me I should eat 2472.6 calories per day (almost 1000 calories more than the fitness pal app) so I am guessing the extra 1000 calories comes from the workout program? Would you say this is correct? If I did not want to do the workouts, could I just use the estimated calories from my fitness pal? Hi Rachael, Since you are nursing it would be best to talk to your doctor about your calorie need and also an exercise program that he or she believes would be a good place for you to start. Myfitnesspal in my experience is a great tool for tracking calories, but some of the recommendations do not consider outside forces that could change your calorie intake number. After my calculations it says that my calorie goal is 1267. Is that enough calories to consume while working out? Hi Lisa, Yes that is perfectly fine. Hi Bethany, Can this work without the workout program? According to my fitness pal I should be consuming 1200 calories per day to lose 2 lbs per week. I weight 250 lbs, so this plan tells me I should eat 2400 calories per day (1000 calories more than the fitness pal app) so I am guessing the extra 1000 calories comes from the workout program? Would you say this is correct? If I didn’t do the workouts, could I just use the estimated calories from my fitness pal?